It may seem a rant or that I am over-reacting but in 24 hrs, India braved two major terrorist strikes: In the first, Naxalites killed 12 CRPF policemen in Chhattisgarh and in other incident, 18 persons killed in Manipur in blasts by suspected People Revolutionary Party of Kangleipak (PRPK). Ironically they were not considered terrorist strikes. Not one inspector MC Sharma, here 12 central policemen were killed but how much coverage did the deaths get in national media? Chhattisgarh could be far from Delhi but even a blast that kills one person in any other City, gets much more coverage. The 18 deaths in Imphal didn't send the electronic media guys crazy. Of course, PRPK [or the KCP Military Council that has claimed role in blasts] can't be a story as it has no Muslim-sounding names. Isn't Imphal in India? Had it been in Assam, it may have got a wider coverage. But the main issue is not the lack of adequate coverage of these tragic events. It is about how and why the killers in Chhattisgarh and in Manipur are never called TERRORISTS. 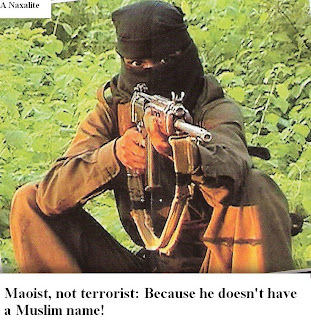 They are called militants or Maoists or rebels or ultra-leftists. I don't even rue the coverage of these blasts in newspapers [in case of blasts where Muslims are suspects, the headlines are always like 'India Attacked' and special articles on edit pages follow for days] or the comparison to blasts in Bangalore, Delhi, Malegaon or any other City. What worries me is that these killers are not even referred to as terrorists. As if a Muslim-sounding name is necessary for that. This is a major grievance. I don't say that you should associate these acts with the religion, language or the cause or even these groups. But, by not referring to them as terrorists, and simply terming PERPK radicals, Naga fighters, KCPC militants or Maoist rebels, the media and our politicians are doing a great discrimination. However, in case of Muslims, the branding is easiy: They are not just terrorists but also insensitively termed 'Islamic terrorists'. Is it innocence? That's what Muslims ask. But they don't get any answers. After every other blast that happen in mainland apart from Naxal-infested areas, Muslims are asked to introspect. We do. But what about you? Will you--politicians and media introspect? Just a few hours after I wrote this post, the police have spoken about the role of Hindu Jagran Manch (HJM) in the recent blasts in Malegaon and Modasa (Gujarat) ahead of Eid. Sadhvi Pragya Singh Thakur and a few others have been arrested. After Nanded, Parbhani, Tamil Nadu's Tenkasi, Kanpur and several other places where activists of Bajrang Dal or similar organisations were found involved in similar acts. There are often, small sub-groups, that can get more radical and extremist. Once again, I would say Terror has no Religion. The first reaction to the arrest of Sadhvi was of shock. Some sections even termed it as a political stunt. The truth is that Congress is not going to gain from the arrests, as it will lead to further polarisation, so it is ridiculous to say that they hae been framed. And there must have been hard evidences otherwise, it was not easy to arrest a religious person, epecially a woman, who had links with top politicians. It is childish to believe that a particular person can't do it. For the last three years, there were evidences that 'ultra-right wing Hindu organisations were involved in such activities'. Once again, it is wrong to term any person who has not been tried in the court of law as yet, as terrorist. It is equally wrong to link the actions with religion. But there are fanatics in all religions. Many Sadhvis spewed venom against Muslims during the turbulent period of mid-80s to early 90s. It is also a dangerous phenomenon to see many right-wing Hindu organisations, already claiming that she is framed, and even offering her legal aid. Some have even justified 'this form of terrorism', as a reply to the 'other kind of terror'. There has been involvement of such organisations in blasts in various cities of Maharashtra, MP, UP, Tamil Nadu and other states. Even more worrying are the reports that retired armymen were involved in some ways to these groups. I am more surprised that many people openly express surprise at the arrests and say that 'those associated with the RSS can't do it'. Sangh is surely involved in some charitable activities but it is an organisation that has a different vision of India and it's history has never been of a tolerant group. Its cadres have played a role in riots and carnages. And it is quite possible for a smaller group within a radical organisation to grow more radical. So let's not brand any particular religion or group, stop justification of any form of violence through Newton's principles and wait for the courts to decide.